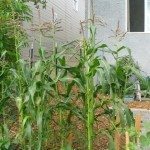 Accidentally put corn gluten down on lawn but need to reseed. I blew most of it off. Can I rake and topdress soil and seed? You can do that. I would also saturate the soil to try to leach away some of the pre-emergent chemicals.